…but they eventually made it up to the viewing chairs. It was windy and cold, so they didn’t stay long. …so they headed back to the Hitty cupboard to warm up. Brisk, chilly, vibrant, cozy….a complete Hitty adventure. 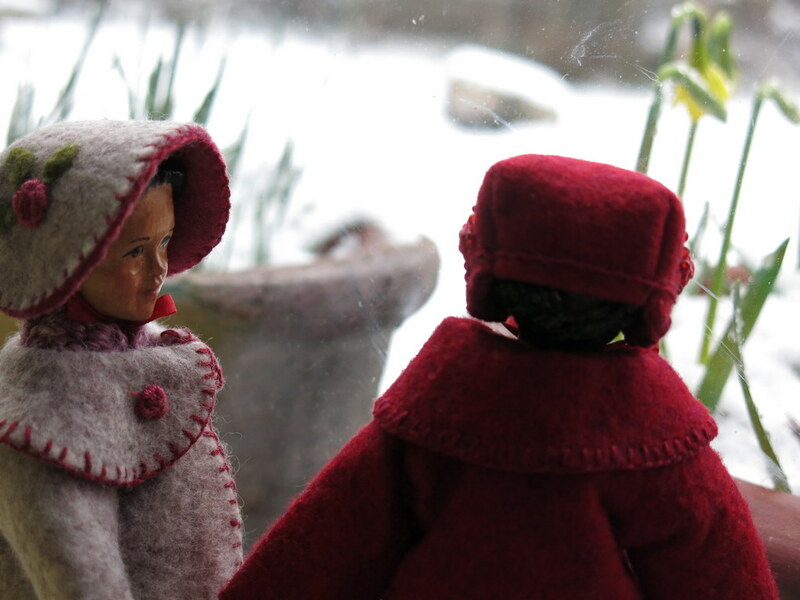 Tuesday and Viola really were looking forward to some nice wool coat-wearing weather… Our winters usually require more rain gear! 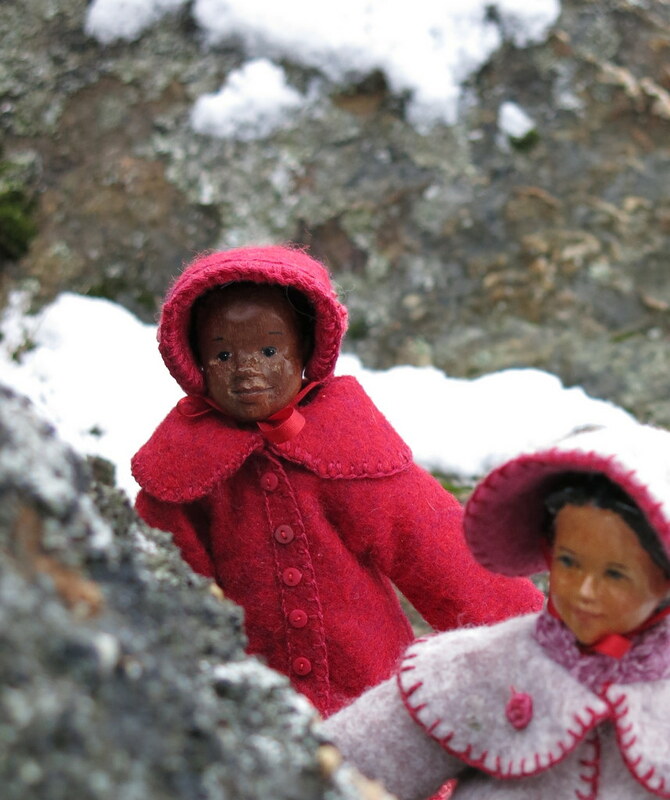 Your coats are stunning, ladies and the traditional bonnets are a fine finishing touch. Lucky you to have real snow. None has settled here this year and I miss it so much. Enjoy your warm up in the Hitty Cupboard! Aren’t the coats gorgeous! 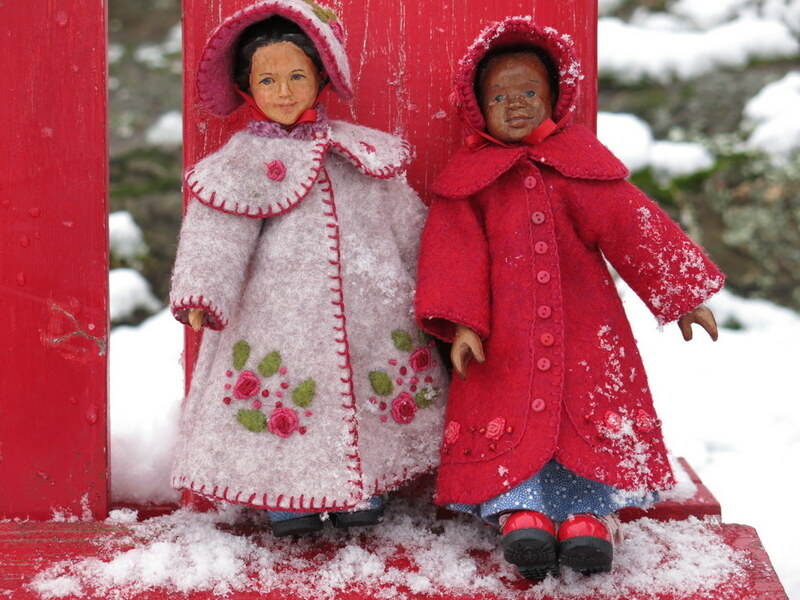 Our Hitty friend Sherry made them and the bonnets too – we rarely have snow and when we do it tends to disappear quickly. The girls were glad! A great adventure for this time of year. And getting cozy later is wonderful too. We love our Hitty adventures – it was too cold to want much more than a little walk and scramble. But getting a little chilly made the warming-up even more delightful! A beautiful tribute to a snowy day! Your photography brings their adventure to life. Thanks! 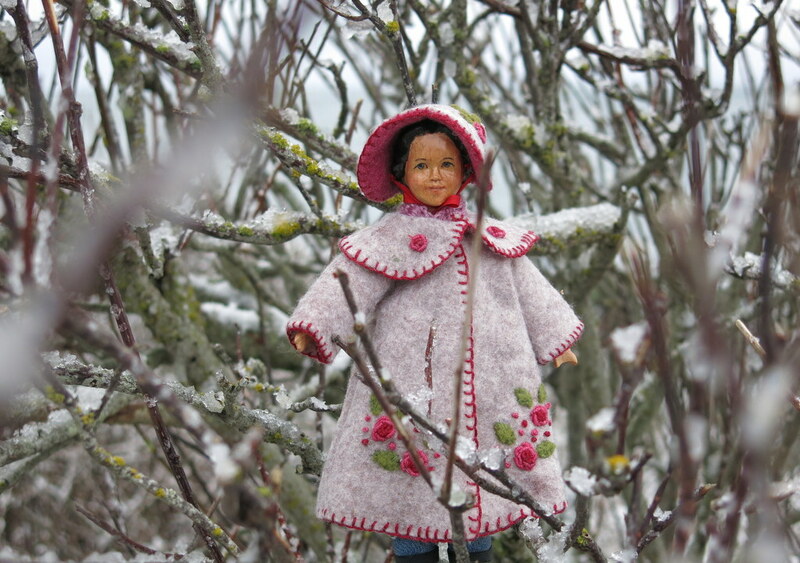 Snow such a novelty here, we can’t resist going out and noticing every little frozen puddle and icy twig! 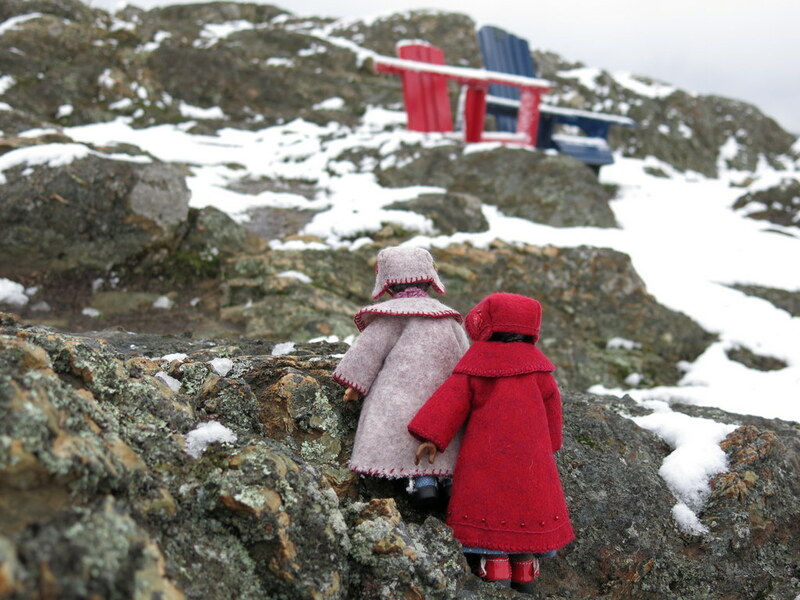 What great photos…and those coats and hats are the sweetest ever. Getting adorable shoes to fit the girls is down right magical. 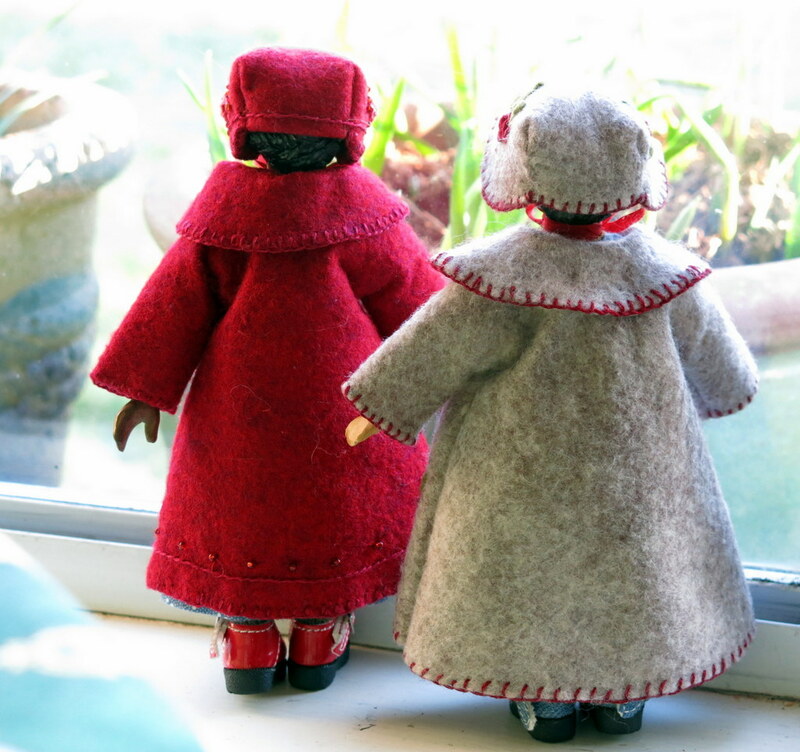 Our friend Sherry made the coats and bonnets, and she also found the shoes to fit the two barefoot Quimper Hittys! They and I are very grateful! the girls look wonderful and cozy in their new outfits. The shoes are great as are the woolie socks. Think the Hitty cupboard is a good place to be on this very windy day. 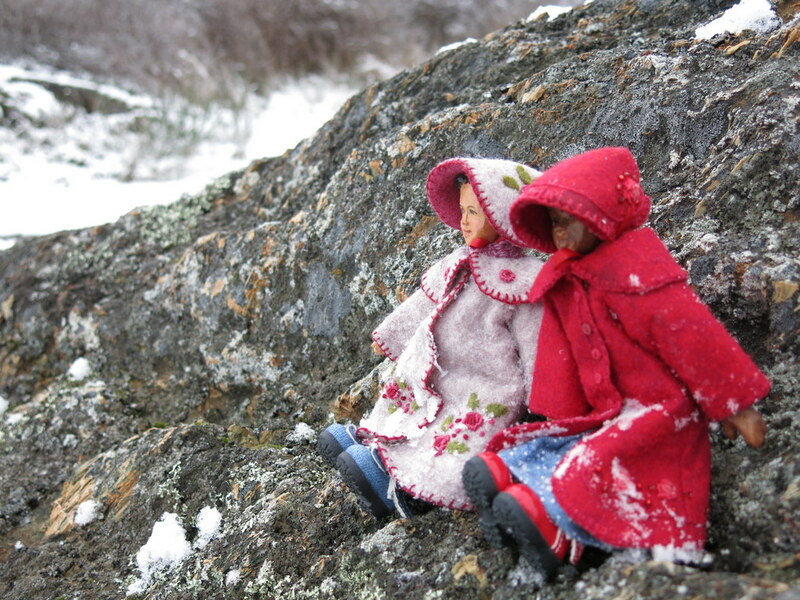 Yes, we are all having rather hibernating tendencies…even Viola and Tuesday didn’t linger for long in the chilly wind! 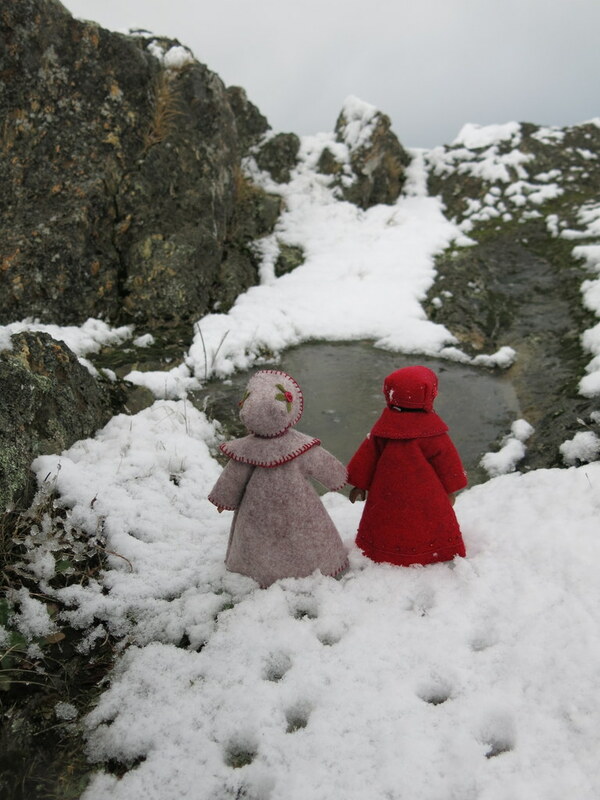 Brrrr, glad the girls got to enjoy some snow and then hurry home to a wonderful warm cupboard. 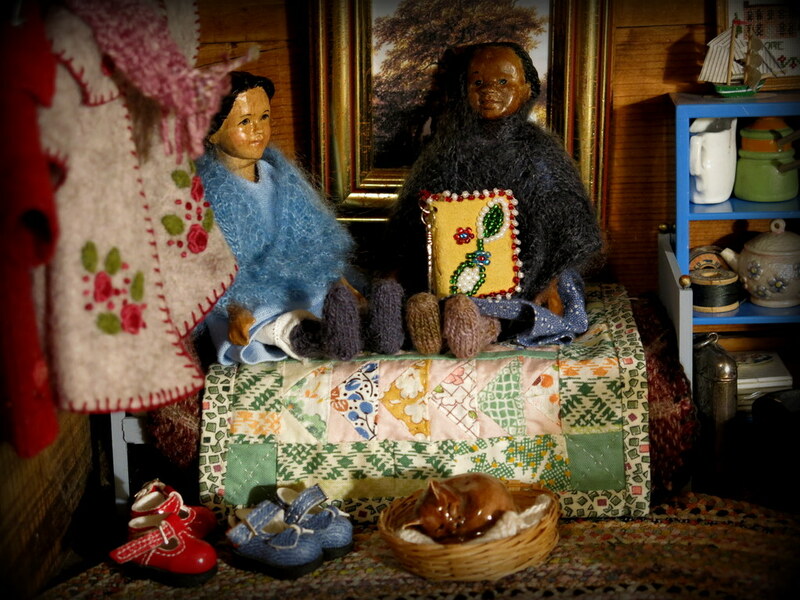 Love the little cat in the basket and the pretty quilt on their bed. Thank you so much for thinking of my cold little Hittys – a day like today is so much more delightful with warm coats, and stout shoes! We love that little kitty, she was the most sensible of all and stayed in her basket near the woodstove! My friend sent them to me – aren’t they so cute!